Just popping by for a quick post to show you another one of my favourite card layouts. This one is also really simple – but because it’s a little different to the cards you usually see in the shops it can have a bit of a ‘wow’ factor. But check out how easy it is to make! This is a gatefold card. So when you untie the ribbon you get to open up the card to see the message inside. 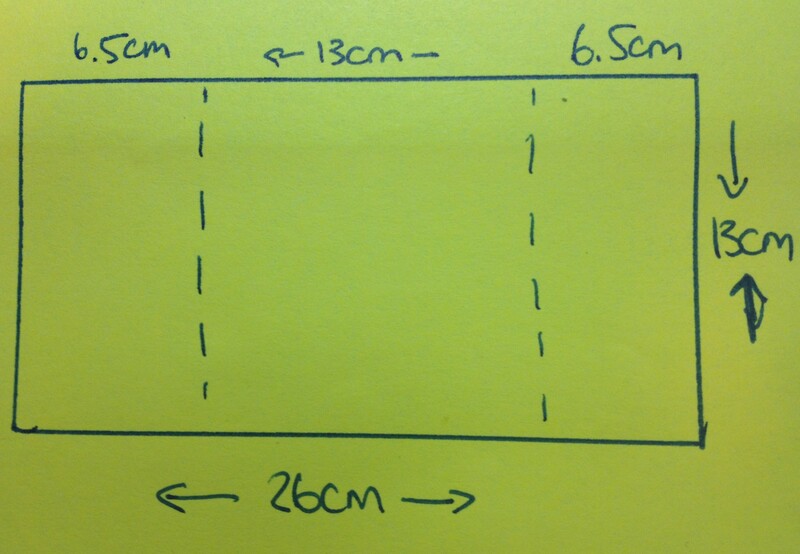 The dimensions will depend a bit on the size of your envelope! My square envelope for this card was 14 cm square. So I wanted to make a 13cm square card to fit inside. This means I cut a piece of cardstock 26cm x 13cm. To make a square card that opens the normal way you would just score and fold the long side at 13cm to make a 13cm square card. 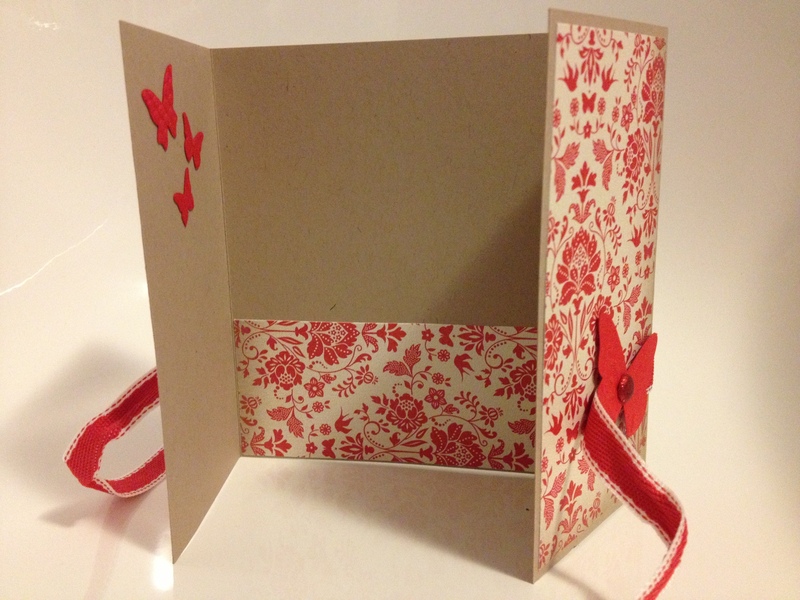 To make a gate fold card you need to fold in from either side to make the ‘gates’. So you score and fold at 6.5cm in from either end of the long side. And here’s another picture of the card showing a little more of the inside. I’ve used some butterflies cut out with my Beautiful Butterflies die to decorate it. The strips of paper on the front are 12.5 cm x 6 cm. 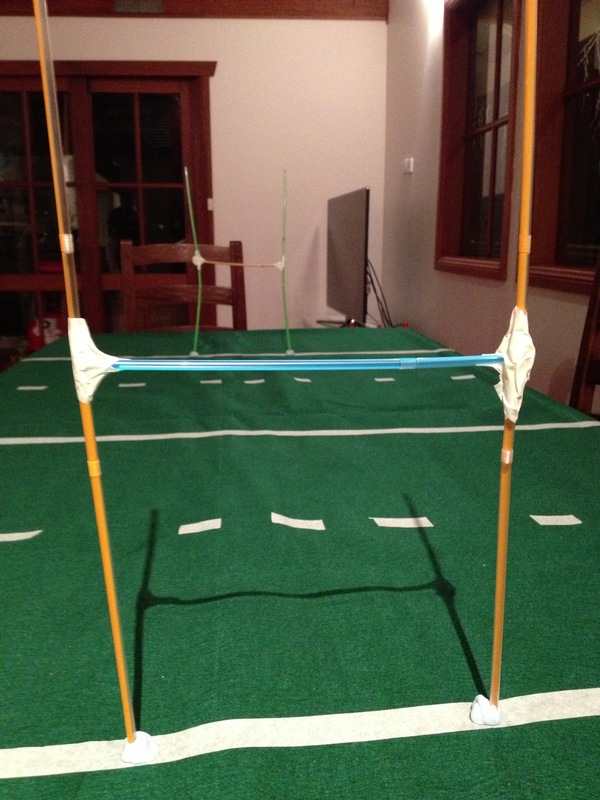 And the strip at the bottom is 13cm wide – I can’t remember how high but it really doesn’t matter. This layout is another good way to use up those little scraps of paper you can’t quite bring yourself to throw out because they are so pretty! You can add the ribbon in a couple of different ways. For this card I’ve just glued the ribbon across the back of the card. 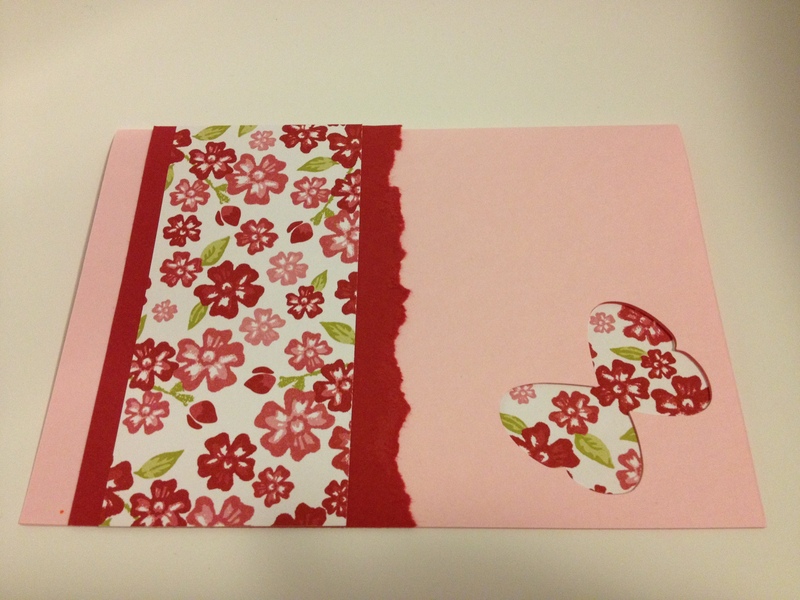 You can also punch holes in the front of the card and thread ribbon through and tie a bow. You can use this layout in so many ways. I will try and post some more examples of cards I’ve made using this layout soon. Just a short post today to show you one of my favourite card layouts. 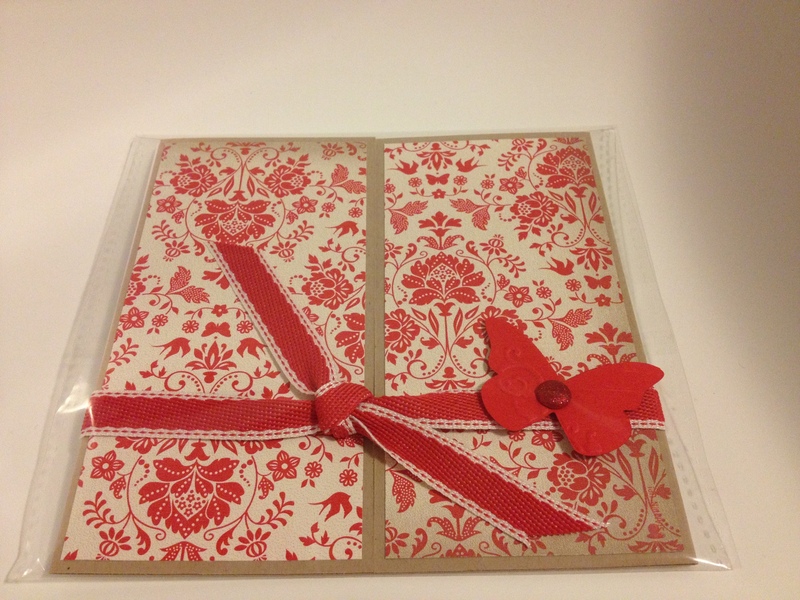 I have made this in lots of different colours – this one is Stampin’ Up! Crumb Cake and Marina Mist. I used a Marina Mist C6 card blank and ribbon with a Crumb Cake card stock layer and ink. 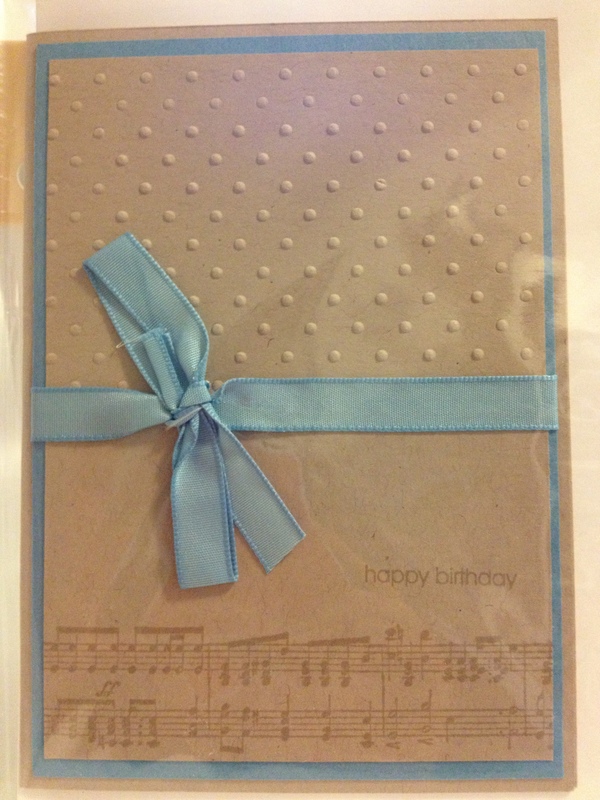 The music notes come from a Stampin’ Up! wheel (“Music Notes” with a little happy birthday greeting. I ran the top of my Crumb Cake layer through the Big Shot with my Perfect Polka Dots embossing folder for a little extra texture. I’ve made this card with Night of Navy, Melon Mambo and Bravo Burgundy (now retired) – but I can’t really think of too many colours this wouldn’t work with! PS This was a card I had wrapped up in a cellophane bag to give to an Op Shop to sell. Next time I’ll photograph it OUT of the bag! Hello! Thanks for stopping by my blog. Yesterday I showed you some cards I made using the Stampin’ Up! full heart punch. I mentioned that you shouldn’t throw away the spare punched heart – and here’s why not. I used the cut out from the heart punch and another cut out butterfly on top (see how the wings aren’t fully stuck down to make it look like it’s flying?) A little faux pearl and I think it looks perfect for a little girl’s present. The tag is a mailing tag I got at Officeworks – you can get a box of 100. I normally like making my own tags, but sometimes when you’re in a hurry this is a pretty good alternative! 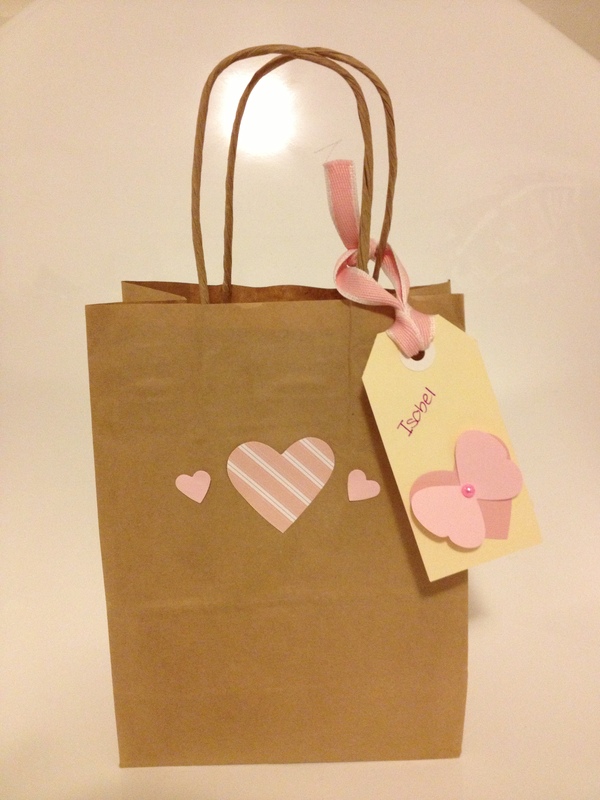 I also have a stash of blank gift bags I get from $2 shops for this kind of occasion. 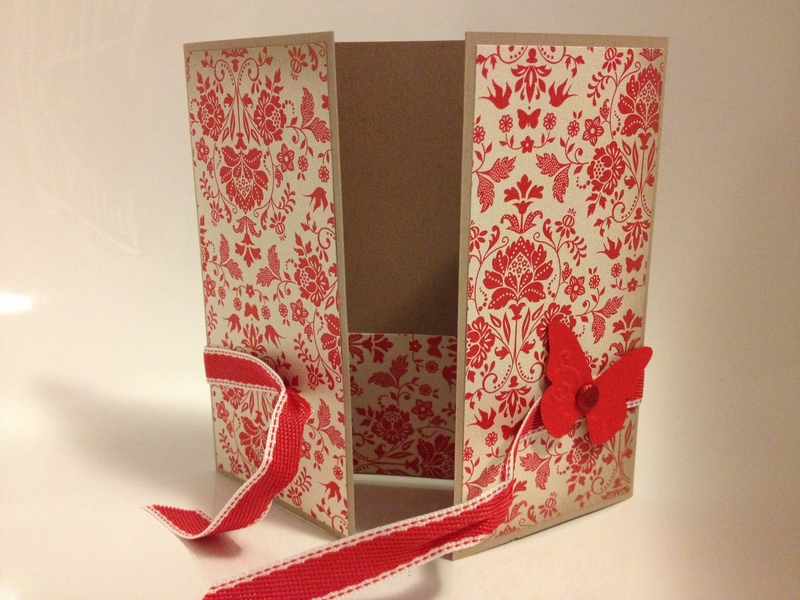 A few punches from card stock and scraps of pretty paper and you’ve got a lovely gift with virtually no effort. I think they look gorgeous (if I do say so myself!) – and certainly they don’t look the result of 2 minute’s effort. 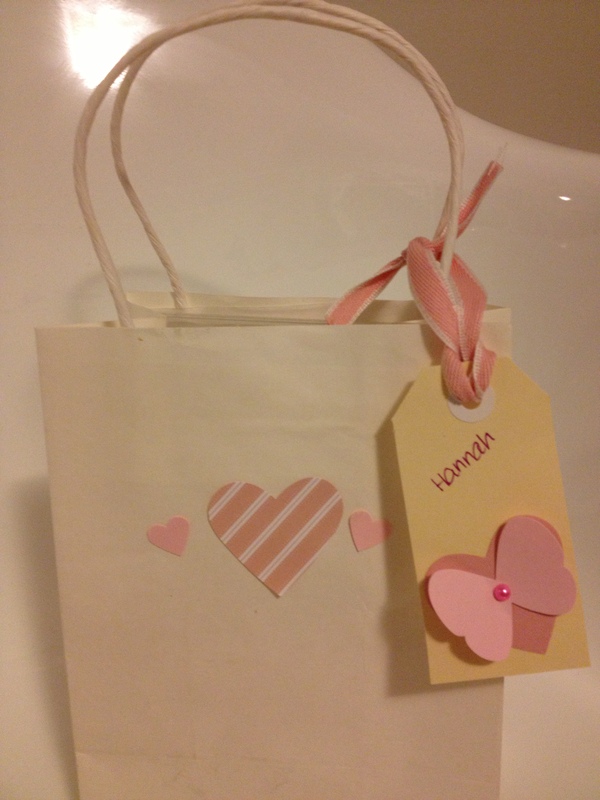 If you don’t have any punches, you can still make a really pretty gift bag just by cutting pieces of paper to cover the front of the bag. 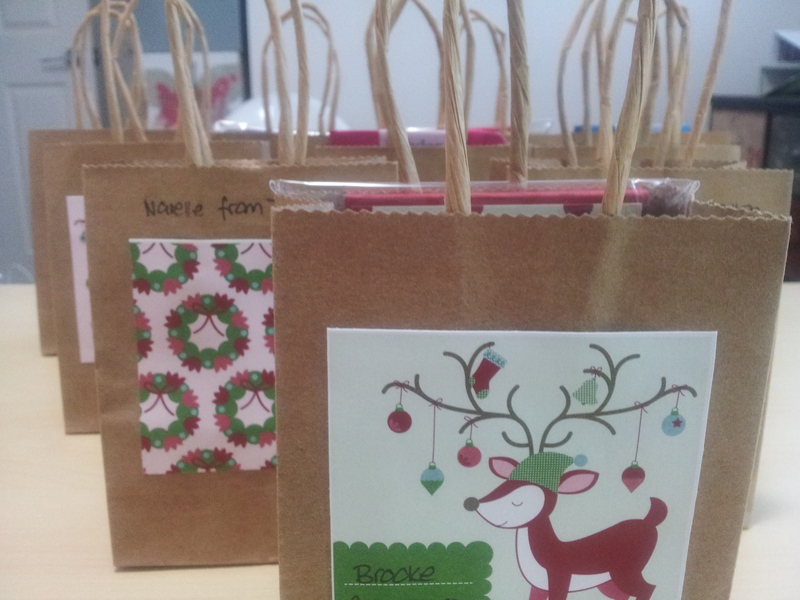 Have a look at some bags I made for my son’s daycare teachers last Christmas. The designs were just cut out with scissors from some Stampin’ Up! designer series paper. 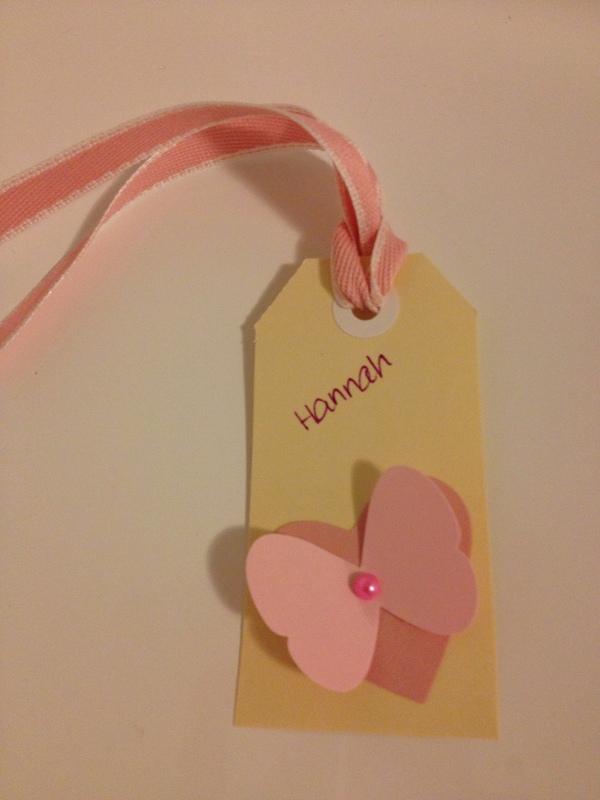 One of the little girls had had a lovely time playing with my Stampin’ Up! full heart punch when she came to visit one time, so I’d bought her one as her birthday present. So I wanted to make a card using that punch to give her some ideas of how to use it. Thankfully I have a few fail safe card layouts that are fantastic when you need a quick card that is still effective. I’m not sure what it’s called, but I call it a ‘punch trick’ card. I learnt this from Sally Ann Williams, whose blog is definitely worth following for lots of lovely (and simple!) card making techniques. 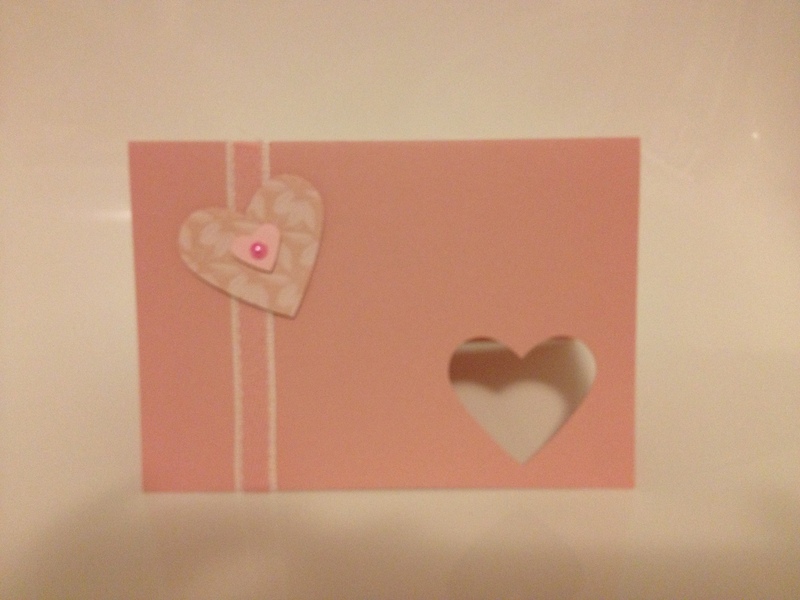 You can see I’ve cut a heart out of the front of the card and then another heart out of designer series paper. (Don’t throw the card stock away!). 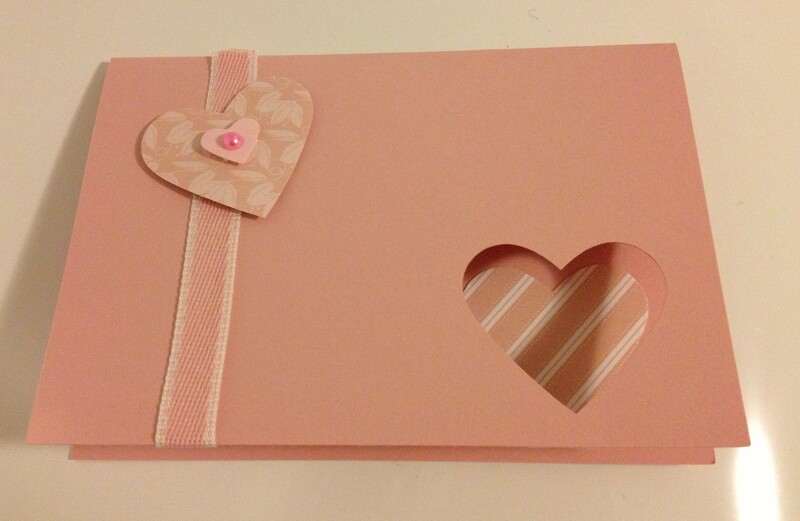 Stick the designer paper heart on the inside of the card and it makes a heart shaped “window” which can look really effective for a simple card. TIP! 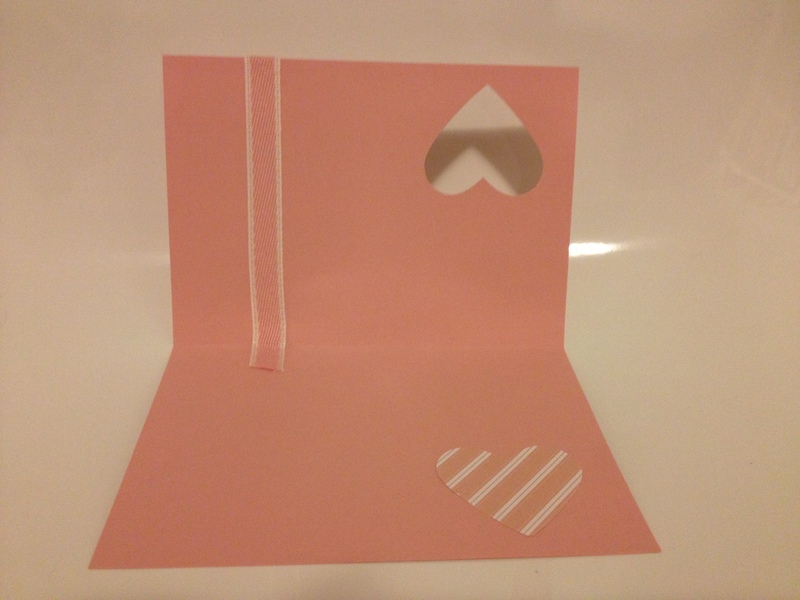 Don’t try and glue the heart on the inside of the card and hope to have the punched window and the cut out shape perfectly align. It’s much better to close the card and stick the pretty paper through the window. Perfect alignment every time! I used some ribbon, another full heart punch from DSP and a punched small heart and faux pearl just to add a bit of extra detail to the front of the card. Don’t think this layout only works with hearts either! You could try birds, cupcakes, butterflies – or make a window to highlight a sentiment. It’s a great card layout for using up small bits of pretty paper you can’t bear to throw away. 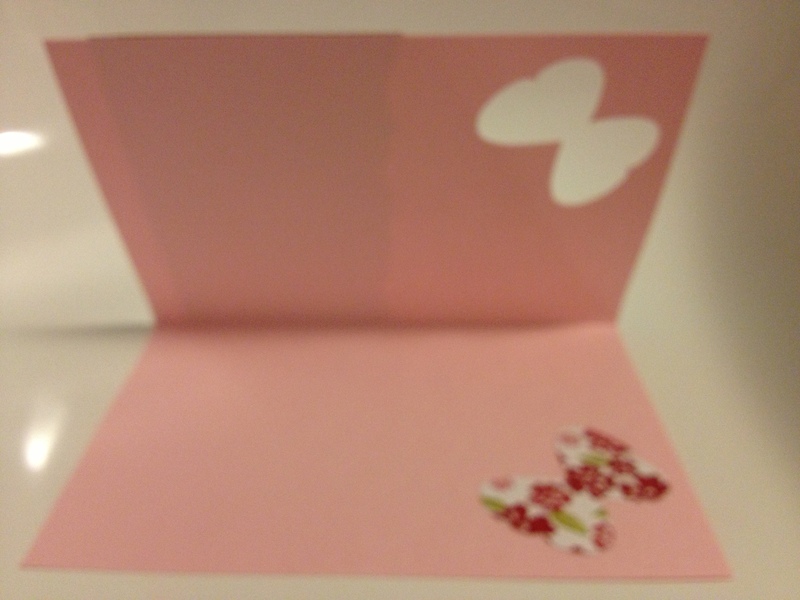 I mentioned that you shouldn’t throw out the heart/butterfly you cut out from the front of the card. Stay tuned tomorrow and I’ll show you why not! 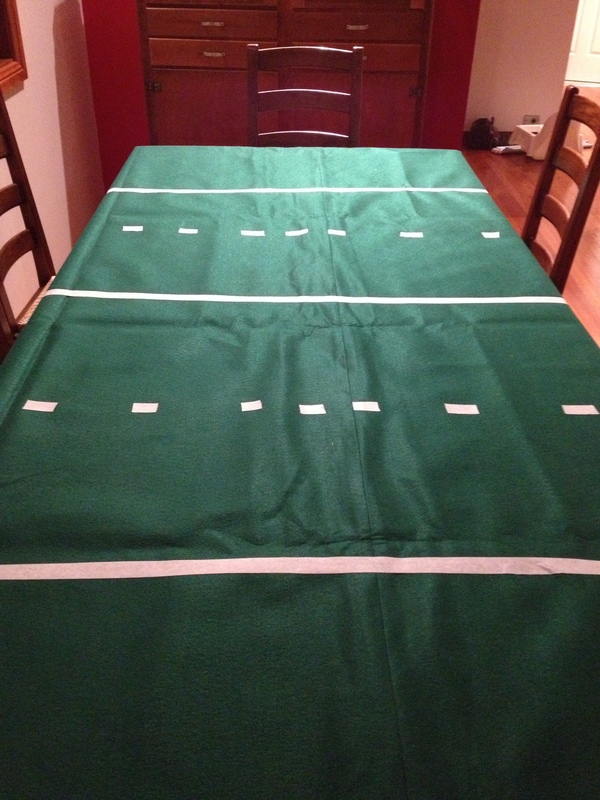 A while ago I showed you the invitations I made for my rugby obsessed little boy’s rugby themed birthday party. The party was a great success and he had a ball. 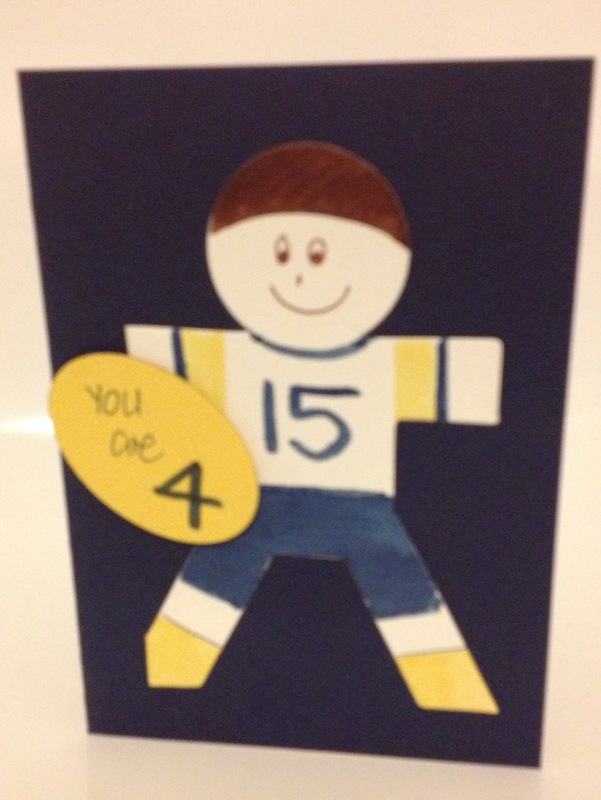 I used a paper cut out doll from a 2 dollar shop and coloured in the Brumbies colours. Jesse Mogg is number 15. 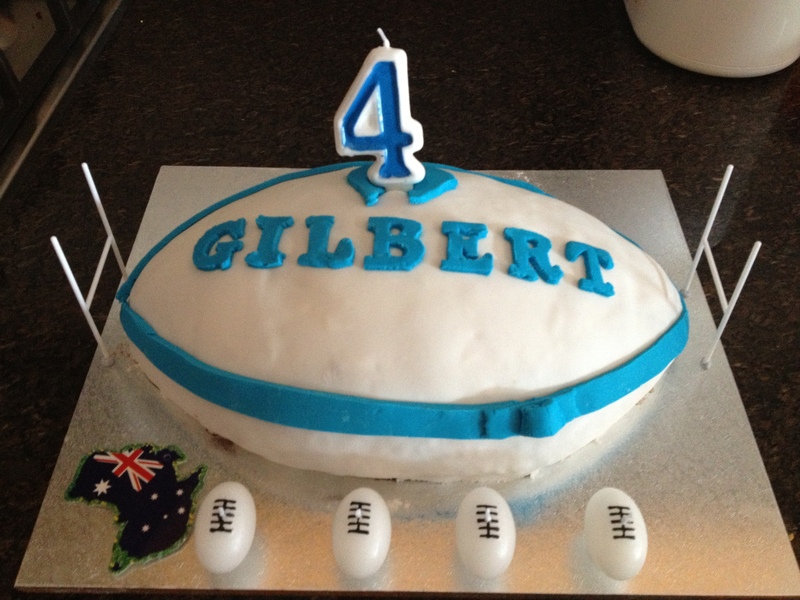 A large oval punch substituted for a rugby ball shape – and he was very pleased with the end result! I also have to show you the cake – I don’t even want to tell you how long it took to colour the blue icing and cut out all the letters! My hands looked like Smurf hands by the end of it! Sorry for the long delay between posts. Work has been very busy. Add into that a 4 year old’s birthday party and some overseas work travel and there hasn’t been a lot of spare time lately! 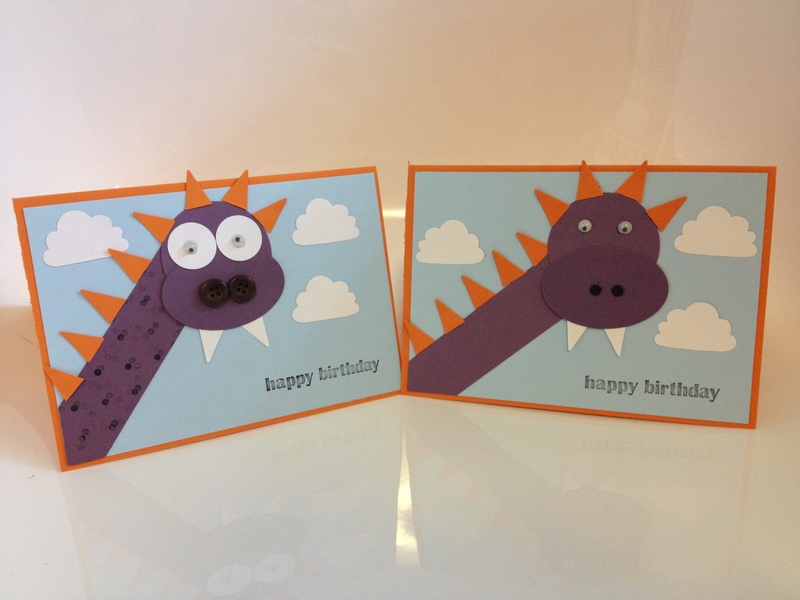 I finally got to do some card making today though – with my 4 year old, which is always nice and can be challenging! 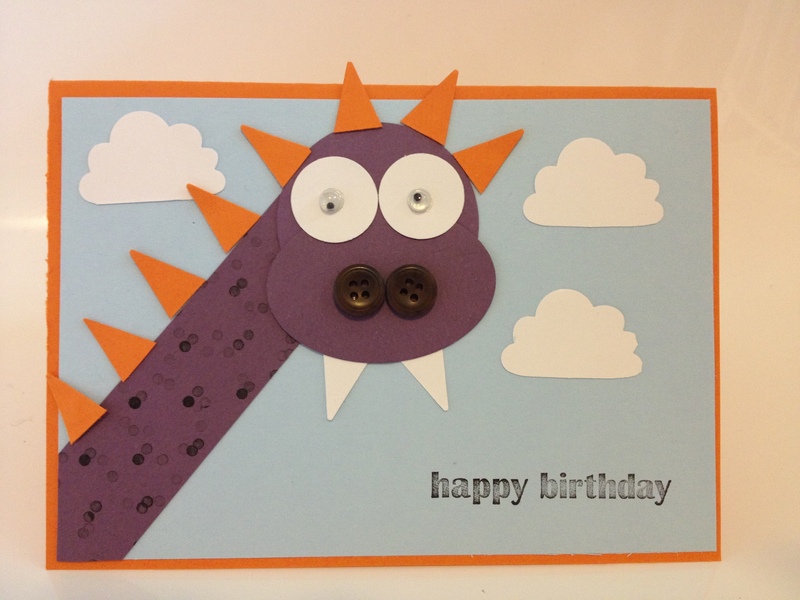 He is off to his friend’s dinosaur themed birthday party tomorrow, so we decided to try and make a dinosaur themed card. We started by a little Google searching for inspiration, and he decided he’d like to try and make a dinosaur a bit like this one (made by Sandra Jayne Wingate). He was quite pleased with that one (as was I!) – but then he decided we could do better! So here is Dinosaur Mark II – with added spots, buttons for nostrils and bigger whites behind the googly eyes. These were pretty easy to make. The orange card blanks were standard C6 size. The pale blue was cut 10cm x 14.3cm. Spines & teeth – edges cut from a star punch (retired). You could also use petals from any flower punch, the tip of the bird’s wing or tail from the Bird Builder punch or just cut some triangles from a strip of paper (or divide a square punch into 4). You could even use the ends of the Modern Label or Word Window punches … the possibilities are endless really. 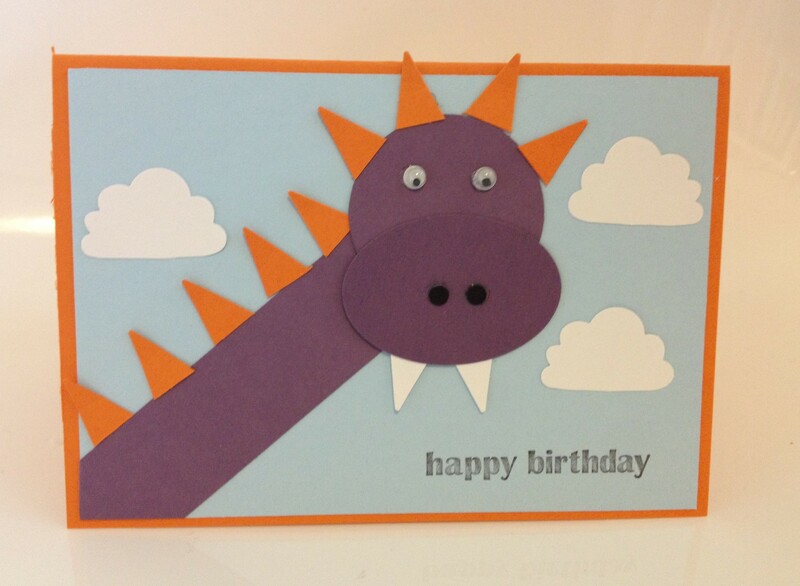 I hope the birthday boy enjoys his dinosaur card!